How To Make Your Own Slime The Easy Way! Home Review How To Make Your Own Slime The Easy Way! If I hear ‘Can we buy some Borax please?’ one more time, I will implode! The craze to make your own slime is everywhere and YouTube is awash with copious videos on the best way to make homemade slime… but surely there has to be an easier way than shopping for items you don’t even know! Does anyone know what Borax actually is?! 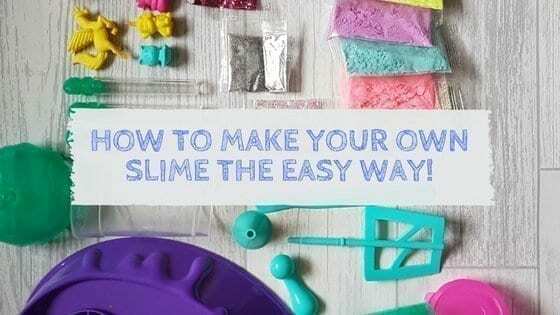 Fortunately there are easier ways to make your own slime, thanks to So Slime DIY from Canal Toys! Liv was recently sent the Slime Factory set, part of a fantastic range of So Slime DIY products, that enable you to make your own slime, without the hassle of having to track down all the necessary ingredients. It really could not be any easier to make your own slime and as expected, after setting up the Slime Factory with each item in its place, Liv had a quick read of the instructions and she was making slime in no time. Simply mix water, powder and glitter together in the mixing container, whisk away for a few minutes and there you have it. No mess, no fuss and certainly no Borax! Well… there would be no mess if Liv had put paper down to catch glitter that never made it into the mixing container, though the dog was somewhat sparkly for a few days! The slime does need to be stirred a lot for it to become the perfect consistency and also make sure you keep it in an airtight container, otherwise it turns hard and not slime like at all! The set includes metallic, neon and pastel slime powders, but as you can see, Liv combined a large proportion of the slime she made. The container pots are super cute and great to give slime as gifts in, which Liv did, much to make squeals. Can you tell I am not sold on the whole slime craze yet?! The Slime Factory is aimed at children aged 6+ and for Liv this was perfect as it was simple and quick to use and she could crack on with making her own slime. There were a few occasions where I needed to take over the whisking process and in the end, the turning section of the whisk did snap off. Liv was using at the time and was so bitterly disappointed, but ended up still whisking with other implements. Colourful, engaging and well made with the exception of the whisk tool (though Liv was probably using excessive force! ), both Liv and I would totally recommend the Slime Factory. The set is awesome and the factory base keeps everything in one place, so it is very easy to store and keep tidy. You can purchase the Slime Factory from all good toy retailers, including Smyths for £19.99 RRP, which I find quite reasonable. There are more items in the So Slime DIY range too., including kits to make your own bath bombs! Have you managed to successfully make your own slime? I honestly don’t know how I have avoided the question ‘Mummy can we make slime?’. Like most kids, mine is obsessed with the stuff. Maybe I got off lightly. This kit looks good though and is worth bearing in mind should I get asked the question! Thanks for sharing with #TriumphantTales. This looks brilliant! I’ve managed to not make it yet! You are very lucky! I have to buy washing up liquid more often that I would like! Oh this is cool, my nephew’s birthday is coming up, and this would be just perfect for him! Ok how much fun does this look! Slime seems to be all the rage at the moment and I love the idea of being able to make your own before you get to play as well. I actually hate slime but my daughters LOVE it!!! This looks considerably less messy than the attempts we have had and less mess definately gets a thumbs up from me. My son would like this. We have tried and failed at so many recipes I’ve followed exact measurements with exact products and followed the video but still no slime. This is really something that my children would love. They really are obsessed with slime at the moment and keep going on about me buying it or ingredients to make it. I’ve only once attempted to make slime because all the teachers in my school were making it in their classes…from Borax. There I was at home attempting a trial batch and I read what is in Borax…and the warning label. My class did not even up making slime as I couldn’t find an alternative I was comfortable using. This might be a good idea though. My two love play dough (I’m not so keen!) but it keeps them busy. This looks like fun. There are quite a few recipes about for slime without using borax as one of the main ingredients but this product looks ideal as kids can set to work and make it without too much adult supervision (I know just what you mean about glitter!). My 6 year old would love it although it’s a shame about the whisk.